A sure sign that fall has arrived: the supermarkets are full of nama sujiko (raw salmon roe sacs). 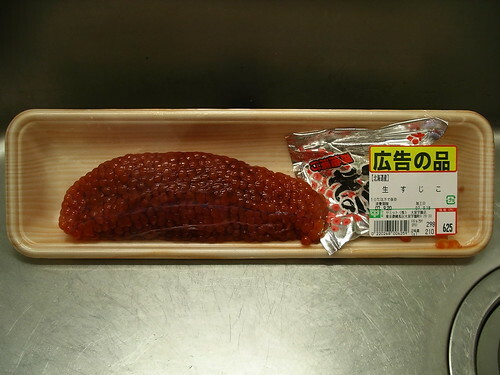 Nama sujiko isn't very good to eat as is but with a little bit of work it can be made into ikura (cured salmon roe). Ikura no shouyu-zuke (salmon roe preserved in soy sauce) is the recipe preferred by home cooks, because it's fairly easy and keeps well. And that's how I've been preparing it for the last few years, either with my own formula of soy sauce, sake and mirin or with the little pouch of seasoning usually sold with nama sujiko. But this time I decided to try making ikura no shio-zuke (salted salmon roe), which is the way prepared ikura is normally sold-- the bright orange roe found in jars at supermarkets and atop sushi. Because it must be eaten quickly and requires a few extra steps it's rarely made at home, but after studying a few recipes online I realized it's not that much more work than ikura no shouyu-zuke. You'll need one sac of nama sujiko. This is what it looks like from a Japanese supermarket: at 210 grams this one's a bit on the small side (I think the average is about 250 grams) and at 625 yen it's a good deal-- it normally costs closer to 1000 yen for a whole sac. Note the little pouch of seasoning, which is for making ikura no shouyu-zuke. If you've never prepared ikura before it's a good idea to use this seasoning as it's fool-proof, but I normally toss the pouch as it contains too many additives for my tastes. Begin by soaking the sujiko in a bowl of very hot water. Use the hottest water you can stand to put your hands in (from 45 to 60C/110 to 140F) and let the sujiko soak for a few minutes. This is to temporarily toughen up the eggs so they won't break easily, as removing them from the sac requires a bit of rough treatment. While the roe toughens it will start to lighten in colour and turn opaque, but don't worry-- this is temporary and your roe will be a lovely translucent orange when you're done. 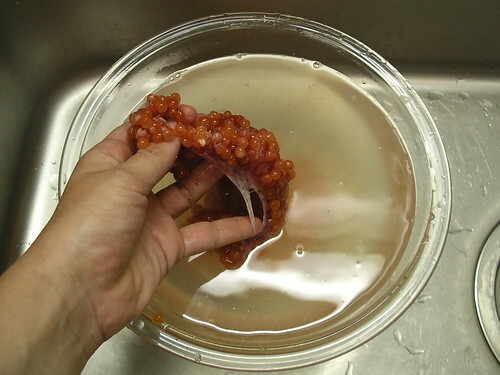 After a few minutes of soaking, use your hands to remove the roe from the thin membrane around the sac. 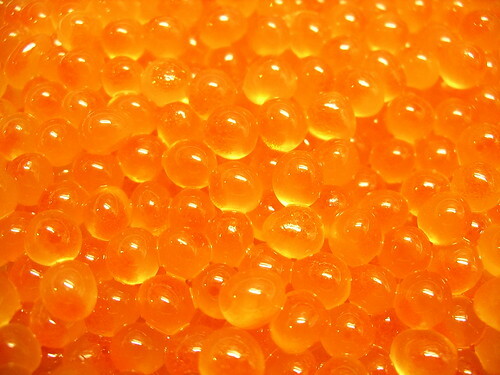 The roe is tougher than you might imagine but still, be gentle as the eggs are liable to pop if you're too rough. Once the eggs is out of the sac there will still be pieces of sticky membrane and veins attached to them, and you'll need to remove it all. It's quite tricky-- and a bit grotesque-- to remove everything, and you'll likely spend at least 20 minutes on this. 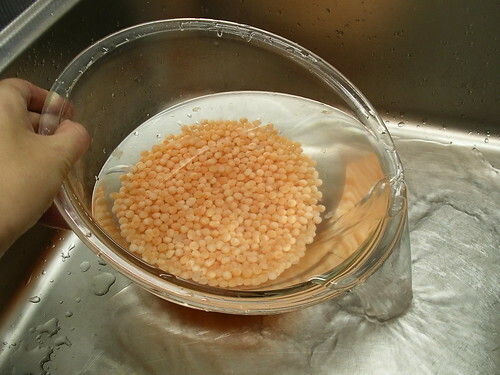 The roe is heavier than the membrane, so the membrane tends to float while the eggs stay at the bottom. This means you can easily find and remove any remaining membrane, and rinse it out with several changes of water. You might also like to give the roe a good stir with your hands and run a tea strainer through the water to remove the floating pieces of membrane. When every last piece of membrane is removed, pour off the water and add a scant teaspoon of salt. Use sea salt or any good fine, non-iodized salt-- in Japan this is easy as pretty much all salt is sea salt. Mix it into the roe gently by hand. 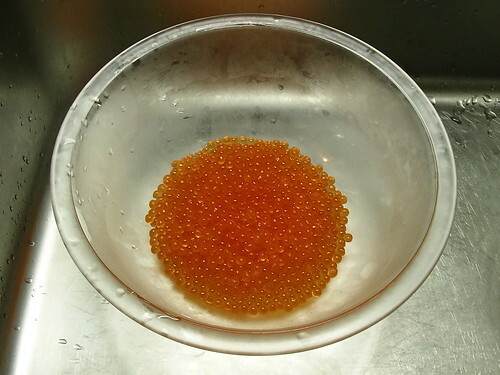 The roe's colour will start to change immediately. Place the bowl in the fridge for half an hour to let the salt absorb. After 30 minutes the roe will be bright and translucent, but it's not quite done yet. Add another scant teaspoon of salt and mix it in gently. 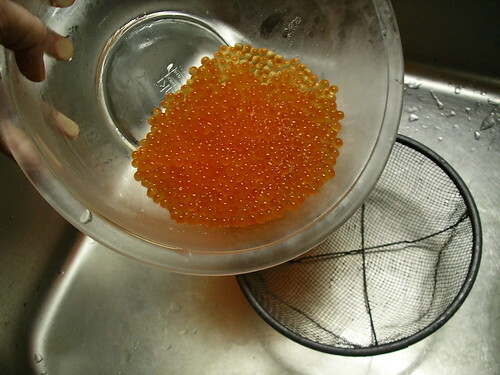 Pour the roe into a sieve. 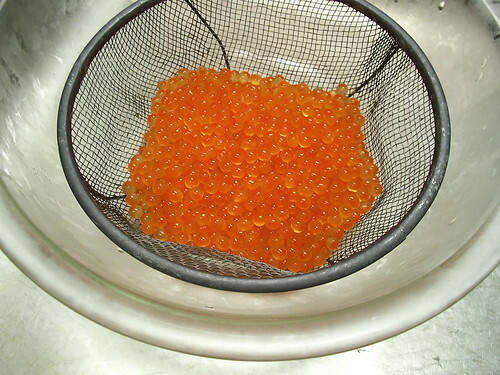 Set the sieve into the bowl and drain the fridge for one hour, or until the roe has plumped up and all the liquid has drained. 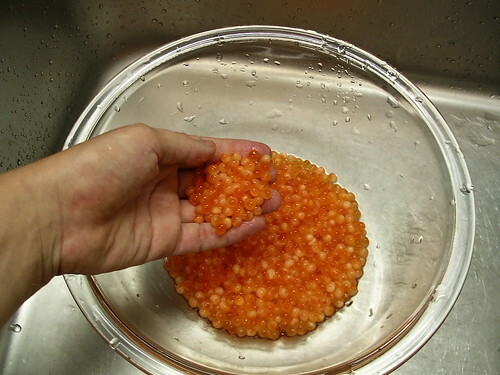 This is the finished ikura: so fat it looks ready to burst, translucent, and a beautiful bright orange colour. Taste an egg-- if you find it too salty, soak it briefly in cold water and drain in the fridge for 15 minutes, tasting again and soaking if necessary. So what to do with it? Ikura great in temaki (hand rolled sushi) or on chirashi-zushi (scattered sushi); in fancy hors d'oeuvres; as a garnish for both Japanese and western dishes; or with Japanese style spaghetti. 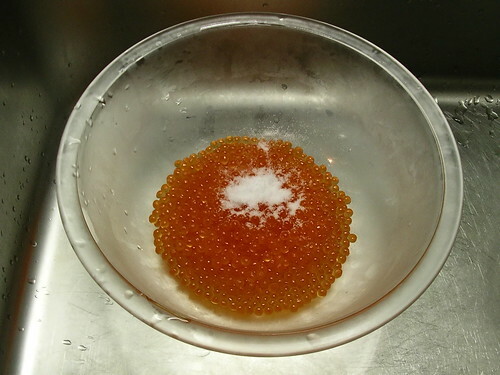 In Japan two of the most common ways to eat ikura are atop daikon oroshi (grated daikon radish) as a tsumami (snack to accompany sake), and in ikuradon (a bowl of rice topped with ikura). However, many of the Japanese uses, especially ikuradon, require the addition of soy sauce and thus are better with soy sauce-cured ikura. If you're going to go to the trouble of making salt-cured roe, you may prefer to use it in a simpler, western style preparation. Again, complete pictures of the process are in my Making ikura album on Flickr, so do check it out if you plan on making your own ikura. that is so cool! I've never done this before. Will have to try. Thanks for the tips. Oh wow! I'm now on the hunt here in NYC for some nama sujiko as I so want to try this. Beautiful! great cooking and pictures. Somehow, I've got a gut feeling that I can cook it too. A nice report. Wow, excellant pictorial! I used to adore Ikura before I became vegetarian. I'll pass this on to my mom in Seattle, thanks! What a phenomenal post. I just copied one of the pictures to my blog and linked it back to you. You are SUCH an inspiration! Congratulations. Joan, too late! I already did. Thanks for all the kind comments, and thanks for the link Andy! surfed onto your blog and i am so inspired by your wonderful pictures and recipes. i like cooking too. 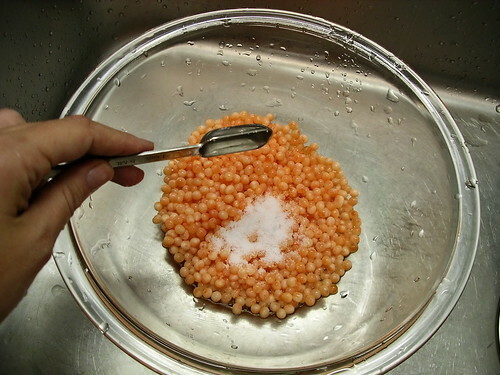 you have inspired me to try making the salted ikura myself. thank you so much for the helpful visual guide. Wow! Thank you SO much for the lesson on making ikura. It is such a favorite for me, that I have it last when I eat sushi and I consider it my dessert. I've often seen the sacs at a local Japanese market, but never knew how to make ikura. Now I do and I don't have to pay a high price for a small jar of ikura anymore!